After a good run, Anne Hathaway has finally met Hollywood’s cool friend that hides in dark corners during castings: ageism, you know him? 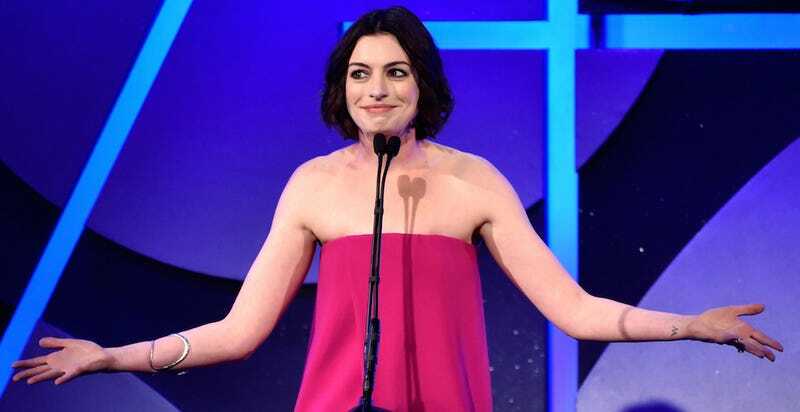 At 32 years old, Hathaway is already being told she’s too close to death to play young female characters. In a Glamour UK interview, The Devil Wears Prada actress admitted that the numbers used to work in her favor. I can’t complain about it because I benefitted from it. When I was in my early twenties, parts would be written for women in their fifties and I would get them. And now I’m in my early thirties and I’m like, ‘Why did that 24 year old get that part?’ I was that 24 year old once, I can’t be upset about it, it’s the way things are. All I can do right now is think that thankfully you have built up perhaps a little bit of cachet and can tell stories that interest you and if people go to see them you’ll be allowed to make more. She just seems to be following her heart. I met her - I hope it’s OK to say this - when she and Jake [Gyllenhaal] were together. She was 20 at the time, and we hung out one night. I was like, ‘You are a magnificent creature.’ She was on fire and I’ve watched her become this force of nature. Don’t fall for it, Anne, don’t do it!